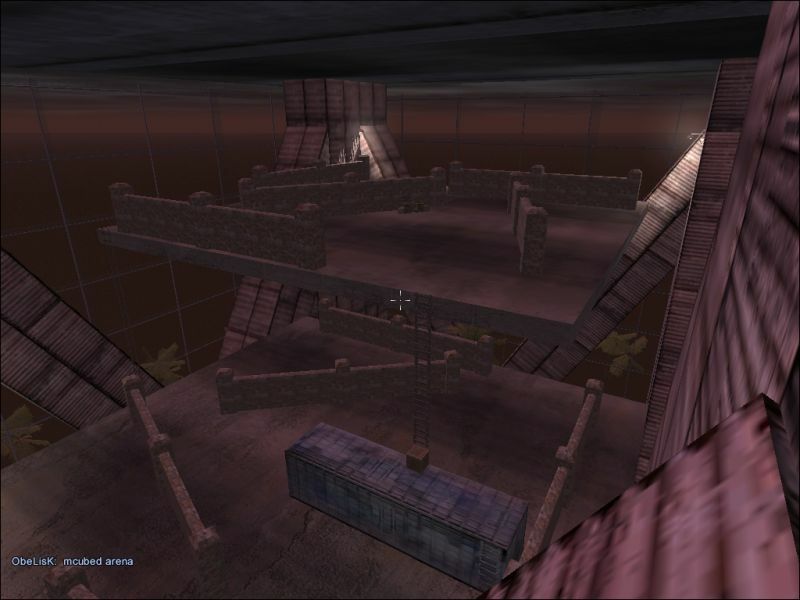 Description: A MAP MADE FROM THE "M" LOGO IN CUBED CITY, THIS ENCLOSED ARENA IS EXCELLENT FOR CBQ BATTLES. KNIVES AND SIDEARMS WOULD BE THE BEST CHOICE FOR THIS MAP. BOTH TEAMS HAVE EVEN AMOUNT OF SPAWNS AND THEY HAVE SPAWNS ON EACH OF THE 3 LEVELS. ABSOLUTLEY NO LEGAL WAY OUT OF THIS MAP, AND A FEW SURPRISES FOR ANYONE WHO DOES GET OUT OF IT. WE SUGGEST A LIMIT OF 16 PLAYERS IN THIS MAP. ENJOY!! !